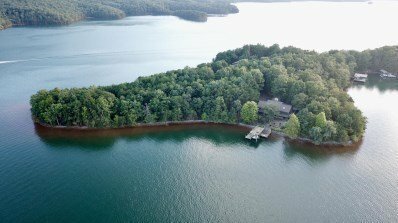 One of a kind property on Smith Mountain Lake. Breathtaking 1.4 level acres with an abundance of shoreline. This unique home is nestled in the woods with wide water and mountain views. An open floor plan with elevated ceilings, wood beams, masonry fireplace and impressive built in cabinetry. Walls of windows bring the outside in. Expansive decks and patios with close proximity to the dock and sandy beach. Come relax and enjoy the tranquility of the lake with family and friends.